50th Anniversary Jaguar (2012), Electric solidbody guitar with JZ/JG body from Fender in the Jaguar series. 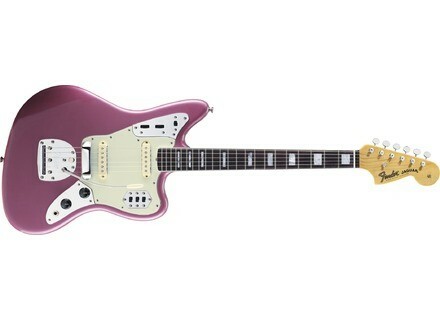 Fender celebrates five decades of the Jaguar guitar by introducing the 50th Anniversary Jaguar model. The instrument takes players back to 1962, when Fender introduced an unusual new guitar that paired a modified Jazzmaster body style and control layout with a shorter scale and smaller, brighter pickups with more output. The resulting Jaguar was the fourth and last of Fender’s original lineup of standard electric guitars. "The model is matched to the early-’60s renaissance in design modernism (as exemplified by everything of the era from autos to aircraft to sunglasses to furniture). A chromed-out, surf-rock staple of the 1960s, it found new life from the mid-1970s-on as an offbeat alternative axe wielded by punk, post-punk, grunge and alt-indie guitar heroes and anti-heroes alike. The same guitar that originally crested waves of reverb-drenched singles by groups such as the Chantays and the Surfaris later fueled, for example, the dynamic grunge maelstrom of Nirvana, the translucent shoe-gazing dream pop of My Bloody Valentine and the literately artful alt-rock of the Pixies, the Flaming Lips and many others." The U.S.-built 50th Anniversary Jaguar celebrates that history and combines old and new. Features include the classic 24” scale length, a new one-degree neck-angle-pocket cut designed to improve pitch, a re-positioned tremolo plate that increases bridge break angle and sustain, and specially designed hot Jaguar single-coil neck and bridge pickups designed to deliver fatter tone and more output. Other features include an offset alder body with lacquer finish, C-shaped maple neck with lacquer finish and vintage-style truss rod, 9.5”-radius bound rosewood fingerboard with 22 medium jumbo frets and pearloid block inlays, separate “lead” and rhythm tone circuits with their own dedicated volume and tone controls, two-position tone switch and on/off slide switch for each pickup, three-ply pickguard (Mint Green-Black-Mint Green), and vintage-style floating tremolo bridge with lock button and chrome cover. Accessories include a deluxe brown case, strap, cable and a set of flatwound strings. Available in classic vintage Fender finishes Lake Placid Blue, Candy Apple Red and Burgundy Mist Metallic, which evokes the original Jaguar’s Burgundy Mist finish option. Eagle Lair HALO Alex Aguilar, former president and design engineer at Aguilar Amps, is announcing Eagle Lair Audio, a new company focusing on guitar products. [NAMM] Reverend 15th Anniversary Flatroc In celebration of their fifteenth Anniversary, Reverend has launched a commemorative Flatroc Guitar. [NAMM] Jarrell Guitars Monte Pittman Signature Phillip Jarrell will debut the Monte Pittman Signature Series of 3 guitars at the NAMM show: MPS.1, MPS.f, and the MPS*Classic.